In this post we show how various secular trends – demographics, inequality and the emerging market savings glut – raised desired savings at the global level and put downward pressure on real rates. We also show how desired investment could have fallen due to the decline in the relative price of capital goods, lower public investment and a rise in the spread between risk-free rates and the return on capital. Together we think these secular trends can account for 300bps of the historic decline in the global real rate. Moreover, we think these secular trends are likely to persist. This suggests the global neutral rate, which acts as an anchor for individual countries’ equilibrium rates in the long-term, will remain low, perhaps around 1%. Part 1 concluded that expectations of lower global trend growth could account for around 100bps of the decline in global real rates seen since the crisis. But given the size of the decline (450bps) and the fact that rates started falling well before the crisis, other forces must also be at play. As well as growth expectations, the global neutral rate will depend on agents’ preferences for desired savings and investment. 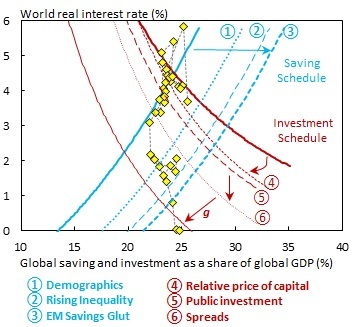 Our approach is to consider the equilibrium real rate that is determined by the global savings and investment curves (Figure 1). Demographics: Over the past 30 years the proportion of dependents (those aged 0-19 and 65+), has fallen from 50% of the global population to 42%. There is a stable negative relationship between dependency ratios and saving rates across countries over time (Figure 2). This is consistent with the life-cycle hypothesis – those who work are also those who save. Every 1pp fall in the dependency ratio translates to around a 0.5pp rise in national saving rates. So the 8pp fall in the global dependency ratio should equate to a 4pp increase in desired savings as a share of world GDP i.e. a 4pp right-shift in the saving schedule. Using the slopes of the S-I diagram which we have based on the existing empirical literature, this translates into an actual fall in real rates of around 90bps (Figure 3). 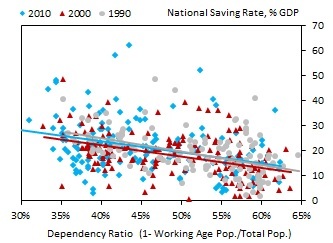 Looking ahead, dependency ratios are expected to remain low this decade, and then increase gradually as population ageing starts to bite. We think this will result in a gradual decline in global saving in the future, but not for some time (after 2020). Others, for example Goodhart (2015), expect a quicker turnaround. Inequality: Since the 1980s, rising income inequality within countries has been a common trend across most of the major advanced and emerging economies (Piketty 2014). Rising inequality shifts the proportion of global income to the rich who have a higher propensity to save. We use Dynan et al (2004) estimates of saving rates by income quintile to estimate what impact this shift in the global income distribution has had on global saving. The rich (those in the upper quintile of the income distribution) save roughly an extra third of their income compared to the rest of the population. This group has seen their share of global income rise by around 7pp over the past 30 years, which translates to a shift out of the saving schedule by around 2pp. This effect could build if inequality continues to rise. Emerging Market savings glut: Following the Asian crisis many EMEs significantly increased their FX reserves. The era of high oil prices also prompted an increase in saving among oil producers. 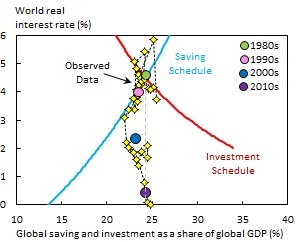 These preference shifts resulted in an increase in desired savings globally (Bernanke, 2005). The current account surplus of Asian EMEs and oil exporters provides one metric for the size of these shifts – averaging 1% of world GDP since the late 1990s (Chart 1 in IMF (2014)). 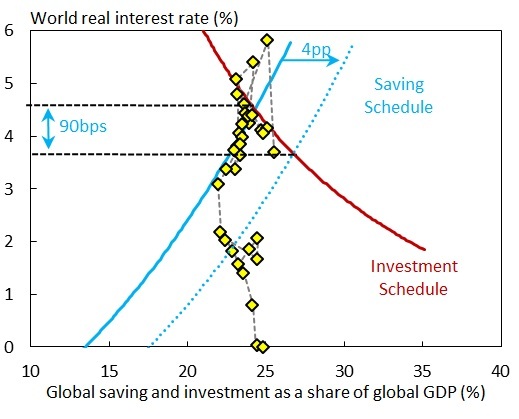 Using this as a guide implies a 1pp rightward shift in the desired saving schedule. This trend could reverse as countries, particularly China, rebalance; but the IMF predicts this will be a gradual process. Fall in the relative price of capital goods: Cheaper capital goods mean it costs less to fund any given investment project – resulting in lower investment expenditure. But cheap capital also incentivises more projects. The net effect of these two forces depends on the substitutability between capital and labour. Most studies suggest the first effect dominates, so desired investment falls with the price of capital. Since the 1980s, the price of capital has fallen by 30% (Eichengreen, 2015). Thwaites (2015) develops a model to assess the size of the net impact. Using his model, we estimate that the fall in the price of capital has shifted the investment schedule inwards by 1pp and pivoted the curve, making investment less sensitive to interest rates. Looking ahead, continued innovation should mean the relative price of capital should continue to fall, albeit at slower pace (see Byrne et al, 2014). Lower public investment: public investment has been on a declining trend since the 1980s (see IMF 2014), particularly in advanced economies. This decline could reflect a preference shift toward smaller governments or a lack of political consensus to push through large projects. This trend had reduced the global investment-to-GDP ratio by around 1pp. Higher spreads: investment decisions are not based on the risk free rate but on the rate of return on capital. A systematic rise in the spread between the two will shift the investment schedule down. 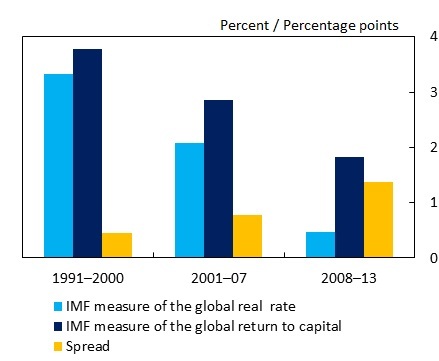 A range of indicators suggests spreads have risen by around 100bps, particularly since the crisis (Figure 4 shows the IMF measure). Risk free rates fell by a little less because savings also fell in response to lower rates. 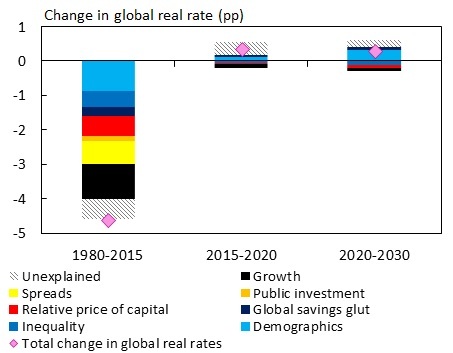 Figure 5 brings all these six trends together, and includes an additional illustrative shift in the desired investment schedule to show the effect of weakening global growth prospects identified in Part 1 (labelled ‘g’ in the diagram). The confidence interval around these estimates is very wide, but we think shifts in preferences can explain around 300bps of the decline in real rates since the 1980s, on top of the 100bps explained by the deterioration in the outlook for trend growth. In other words, we can account for most of the decline in global real rates using evidence independent of the decline itself. Around 50bps of the fall in real rates remains unexplained. This could reflect other trends that we have not been able to quantify here such as rising short-termism among investors (as noted by Haldane (2011)) or a structural shift to lower capital intensity firms (Summers (2014) deems the latter – the ‘WhatsApp effect’). Some of the trends we have identified could also be having bigger effects than we have estimated. Alternatively, the unexplained component could reflect cyclical headwinds and the effects of deleveraging. Or the market measures of real rates we are using, which are derived from government bond yields, could be affected by regulatory changes or QE. Our framework allows us to speculate what will happen next (Figure 6). The big picture message is that the trends we have analysed are likely to persist: we do not predict a big further drag, or a rapid unwind of any of these forces. Some are likely to drag a little further (global growth is set to decline further out; the relative price of capital is likely to continue to fall; and inequality may continue to rise); but this will be broadly offset by a rebound in other forces (particularly demographics). What happens to the unexplained component depends on what’s driving it. In Chart 6 we illustrate the implications of assuming it is largely cyclical. Despite that, this would still imply global neutral rates will stay low, perhaps around 1% in real terms over the next 5 years. Previous Post Drivers of long-term global interest rates – can weaker growth explain the fall?